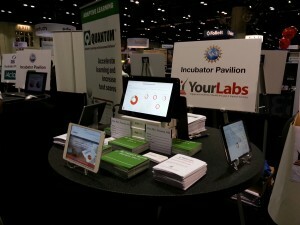 The YourLabs team had the pleasure of attending the Florida Educational Technology Conference (FETC) 2014. FETC is one of the largest educational conferences in the nation and we met over 400 enthusiastic and bright educators from all over the world. The National Science Foundation sponsored our booth in the Incubator Pavilion at the 3 day event. We also gave a talk at one of the concurrent sessions about our learning analytics platform called the Knowledge Evaluation System. We had a blast at FETC and can’t wait for next time! The YourLabs Knowledge Evaluation System (KES) is a complete learning and assessment platform that gathers detailed student feedback for real-time discovery of gaps in student understanding while informing teachers and students of knowledge level and common mistakes being made in the problem solving processes. “Our technology allows teachers to evaluate and improve critical skills in Science, Technology, Engineering, and Mathematics (STEM). By using KES to capture and analyze detailed student feedback in problem solving, teachers can discover how students learn, exactly where mistakes are made, and patterns of learning behavior. This real time data makes instruction more efficient and effective,” says Budhu. KES is also aligned with new Common Core State Standards adopted by multiple states. Global competition in STEM subjects has seen the US ranking decline. Traditionally, teaching has been centered on practices that are centuries old. However, there has been a slow shift to inherent or discovery learning where the process of getting the right answer must be understood. “KES not only determines whether a student got a problem right or wrong but empowers teachers with data to evaluate critical thinking and problem solving skills — the kind of skills required for 21st careers. KES measures knowledge mastery not just test taking mastery,” says Budhu.